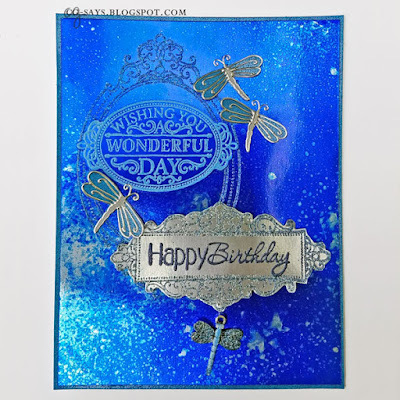 The UnstampaBelles May challenge is Layering with the optional twist of using a border punch/die. You can make whatever you like without using any stamps. To make this Pop Up Box Card, I used some lovely designer papers along with the Summer Crab die from Echo Park. It come with an extra die so you can pop-up the body; an extra layer that adds dimension and some fun. Googly eyes fit so well on them, I couldn't resist! The borders are cut with a QuicKutz die, although in this case I actually used the off-cut part. The anchor is die-cut from a can of water. I attached the premade sentiment banner and the anchor to the card with a brad, so that you can move it for an extra touch of fun. Update: This card was a runner-up at Seize the Birthday! 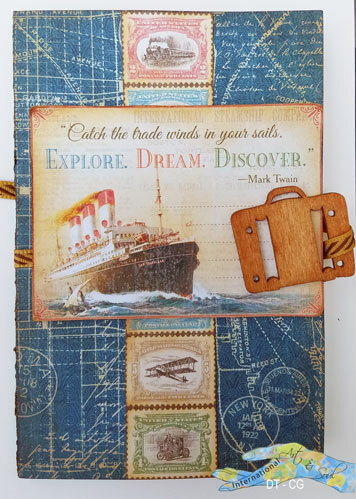 Be sure to check out the fabulous projects by my teammates and hope you'll join the UnstampaBelles this month! Our theme this fortnight at the International Art & Soul Challenge is Vintage. Any craft is welcome! I tried my hand at a Concertina card with some beautiful Graphic 45 papers. Our theme this fortnight at Crafting with Dragonflies is Use a Dragonfly. I've had the pleasure of being on Hilde's fabulous team for almost 3 years, so I'm always collecting a dragonfly-themed items for our yearly Dragonfly challenge. This year, I used silver outline stickers & a silver charm. 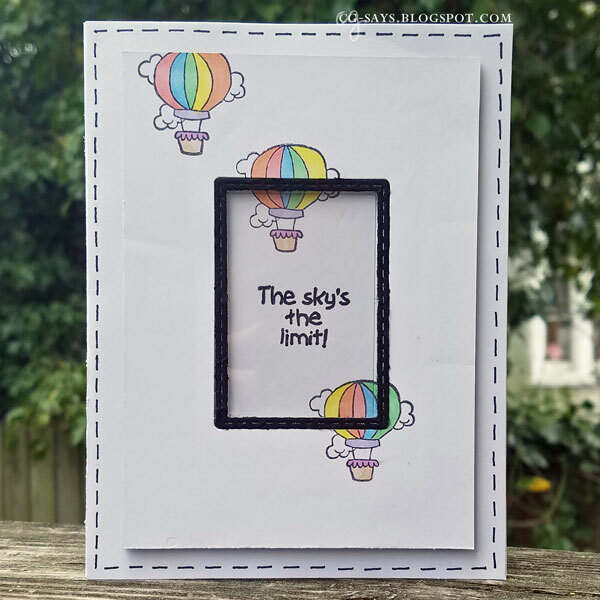 The frames & sentiments are from a Heartfelt Creations set. It's all heat-embossed onto mirror/foiled cardstock. I also added some embossing powder to the dragonfly charm. Update: I was the lucky winner at Tuesday Morning Sketches! I created the shaker window with the frame from the "Build a Scene - Calendar" set by Taylored Expressions. The black frame was made with real black satin material that I harvested from a very old winter coat! I filled the shaker with gold stars; the black & gold are my nod to graduation, as I made this for my neighbor who is graduating from High School next month. The sentiment is from Art Impressions' Flying High Clear Set. I used a pastel color palette for the balloons with Copic markers (R20, B12, YG41, Y02, YR61/E95, BV000, V12, E41). I doodled the outer frame. Our theme this fortnight at the International Art & Soul Challenge is Wings. 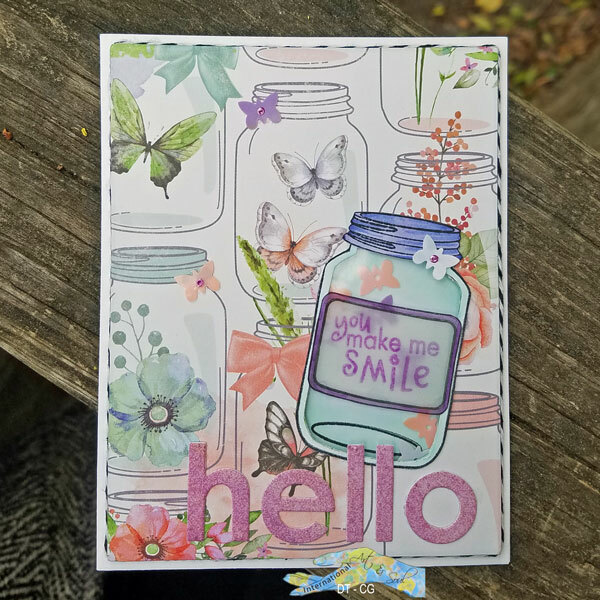 I made a shaker card using this beautiful DP and for jar stamps my Mom fussy-cut for me a few years ago. I filled the shaker with plastic butterfly confetti. I stamped the sentiment onto a vellum label stamp. I die-cut the word "hello" from a watercolor-patterned paper. I added baker's twine to the edges of the popped panel. Update: I was a lucky winner for Pink & Main #20! 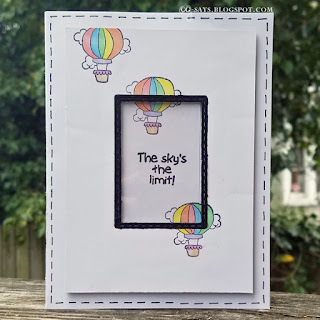 The theme this month at Pile It On is Interactive Card (moving element, pull tab, pop-up, pocket, etc.) Our mid-month optional bonus theme is Birthday. 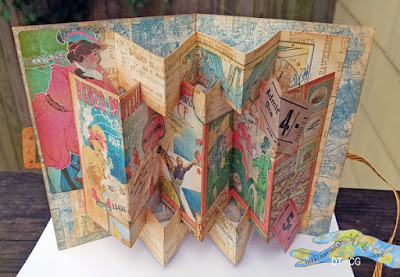 The only really rule is to be inspired by more than one papercrafting challenge. We're sponsored by Gerda Steiner Designs. 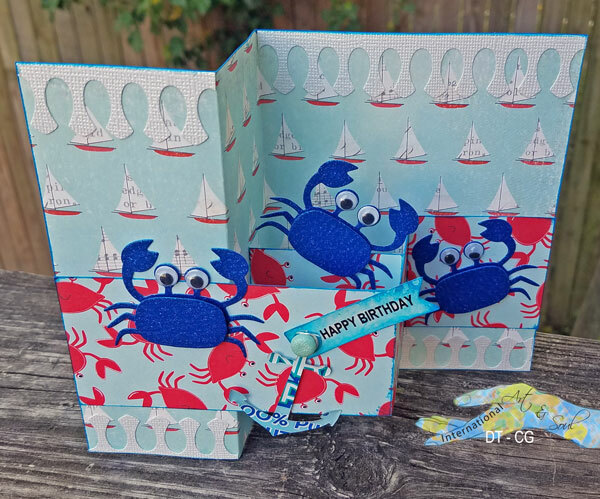 I tried my hand at an envelope fold card. The sentiment on the front is a rubber stamp from The Artful Stamper. The papers are from a paper pad collection called "Going Potty" designed by Paula Taylor. Update: I was the lucky winner at Scor-Pal! 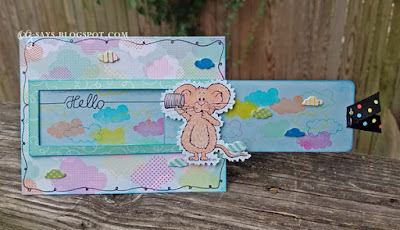 The UnstampaBelles April challenge is Dies with the optional twist of adding one or more Birds. You can make whatever you like without using any stamps. 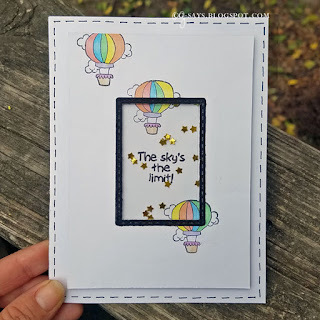 I made a shaker card using a Spellbinders die set. 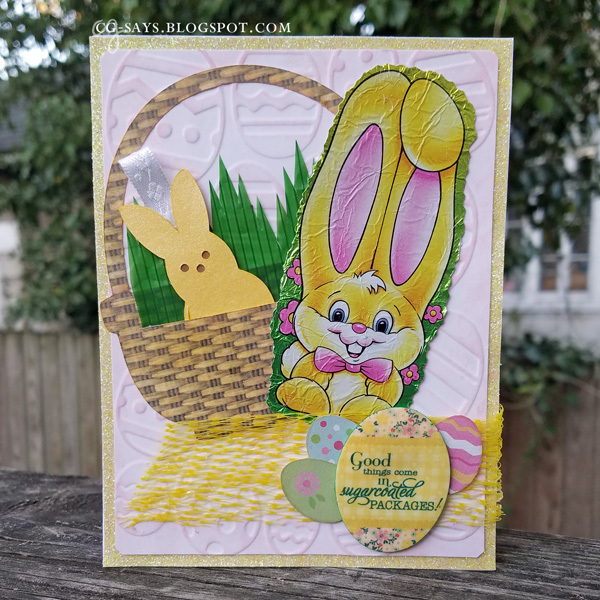 I cut the background 4 times: 1) patterned paper background, using the opposite side of the double-sided paper for the outer frame; 2) white foam; 3) coasterboard; 4) two-toned cardstock that I embossed with the die & sanded. The details on the birds are actually the coasterboard showing through the plastic sheet on top. I used Copic markers for the colors, but painted the eyes with glow-in-the-dark paint. I filled the sections with plastic confetti. 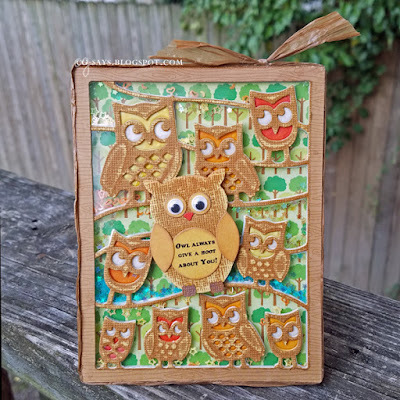 I cut the big owl with a die set I have in my stash. I used the same double-sided cardstock, but added some googly eyes. I made the sentiment myself: "Owl always give a hoot about you!" Our theme this fortnight at Crafting with Dragonflies is Easter Cards. Whatever that means to you, please share your projects with our talented team! I raided my Easter craft stash to make this card. The foil bunny is a wrapper from a chocolate bunny we enjoyed last year! The grass in the basket is from a delicious sushi meal, and the yellow trim is plastic packaging from a bag of potatoes. 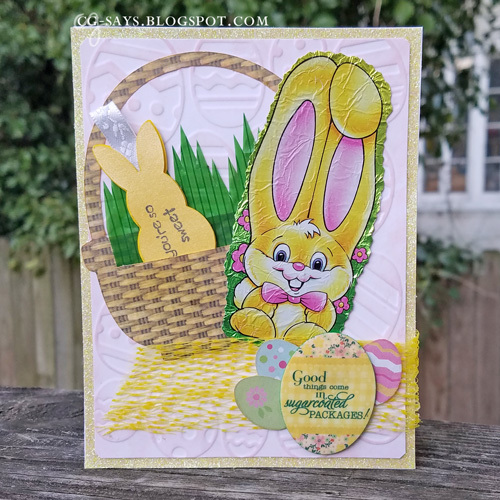 I made a tiny tag from a Peeps bunny svg cut file, and stamped "You're so sweet" on the back. Update: This was a prize winner for Dragonfly Journeys. Thank you! The theme this fortnight at Pile It On is Interactive Card (moving element, pull tab, pop-up, pocket, etc.) The only really rule is to be inspired by more than one papercrafting challenge. 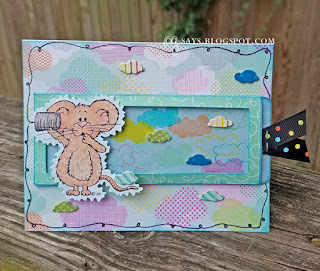 We're sponsored by Gerda Steiner Designs, so I made a simple pocket slider card using their Mouse with Phone. 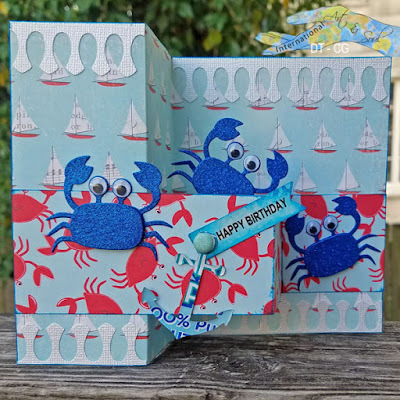 The background paper is from Doodlebug Design's Spring Things collection. I drew the border with a Sharpie pen. I cut out the little clouds from scrap paper with cloud dies from Impression Obsession & Taylored Expressions. Our theme this fortnight at the International Art & Soul Challenge is Distressing. I went with a shabby chic look. 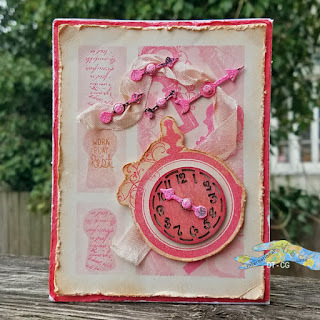 I created the background with CTMH stamps & 3 pink inks. The watch is from the same set. I heat-embossed the metal game pieces & brads with a mix of white & hot pink powder. The edges were distressing with my Ingvild Bolme/Prima distressing tool.